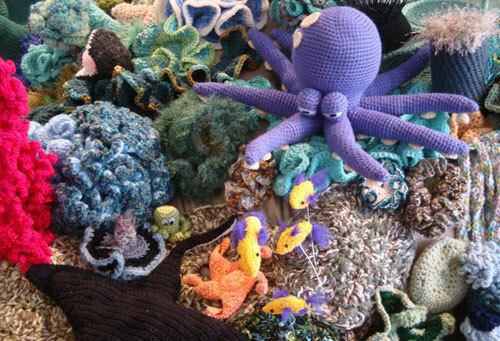 St. Petersburg, Florida's premier crafts gallery, Florida Craftsman, is currently hosting a fiber coral reef, a coral reef that is completely crocheted! 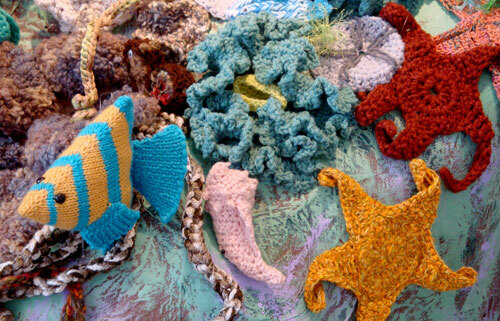 With the assistance of local marine scientists — there are more than 1,500 in St. Petersburg — 267 artists from England, Norway, Canada, Mexico, Texas, Pennsylvania, Ohio and all around Florida have contributed to a crocheted coral reef. The project is in conjunction with a similar coral reef exhibit that's been traveling around the country since 2007. 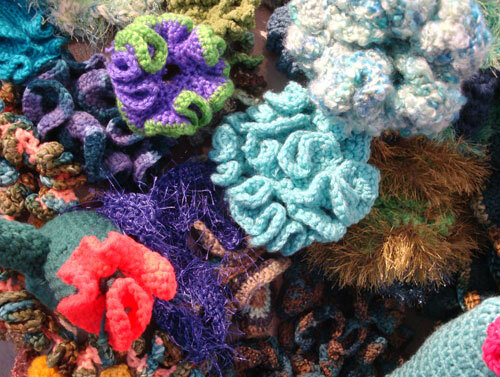 I noticed that crocheting especially lends itself to brain coral patterns. 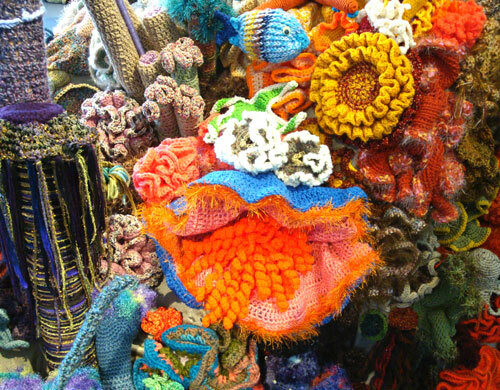 Quoting from the gallery legend, "Corals are made up of colonies of tiny animals known as coral polyps. these coral polyps can create a variety of structures, from a solitary disc the size of a silver dollar, to an intricate and elaborate tree-like structure, to a massive boulder the size of several Volkswagens! The collective growth of these structures over thousands of years make up what is known as a coral reef." "Coral reefs are known as the 'tropical rain forests of the sea' because of their complex, delicate and highly diverse ecosystems. The sophisticated structure of a coral reef provides homes to thousands, if not millions of organisms that all depend upon one another to sustain their lives." 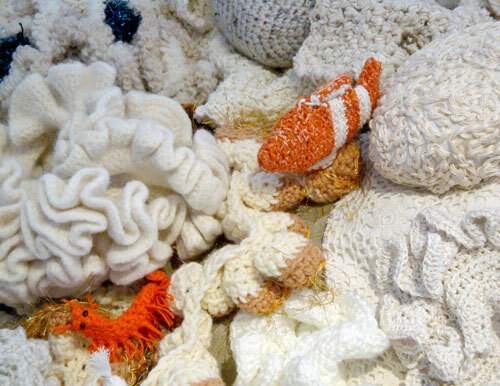 The gallery legends also stress the importance of coral reefs to mankind, and warn that we are in danger of losing 90% of our coral reefs within the next 50 years! Part of the exhibit was even dedicated to illustrating the results of oil spills. When the coral reef is stressed — through heightened water temperatures for example — the algae that provides the coral's pigment is expelled and the coral is "bleached." Though not dead, in order to survive the reef will need conditions to come back to normal and the (zooxanthellae) algae to return. 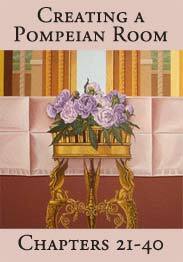 There is a quality of humor and kitsch in the exhibit that is more than counterbalanced by its scope and size. 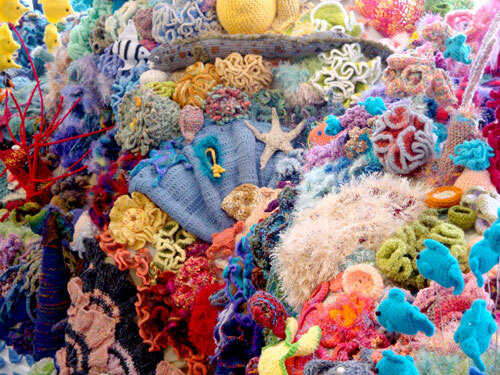 Regardless, it's an awesome project, and the best part of visiting the crocheted coral reef is to see the complete delight of all the viewers, from adults to toddlers. Dear Gina - The curators of this exhibit have done a masterful job of arranging contributions from around the country and the world in a way that mirrors nature quite well. I think that some of those marine biologists who served as consultants had a hand in the display. 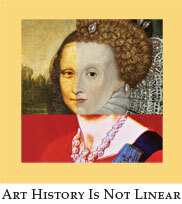 This must have been an interesting and detailed exhibition to visit. The more you look the more you see. 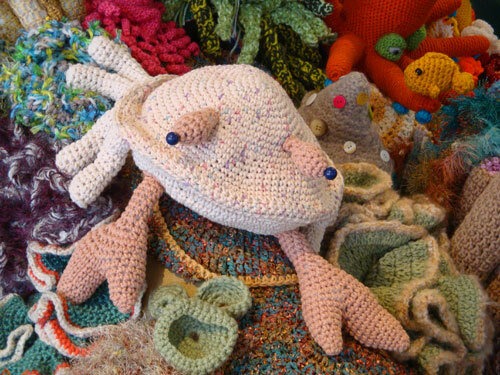 It is incredible what people can do with some wool, patience and needles. 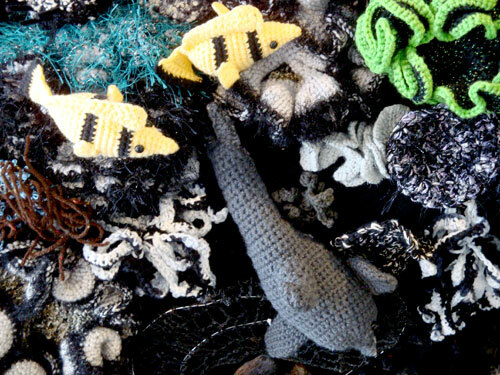 I like the stranded quirky little orange prawn wandering through the bleached brain coral. I didn't want to ruin the illusion by showing the gallery floor, walls and windows, but the coral reef is actually divided into several reefs, two of which extend about 20 feet each. The exhibit completely takes up a large gallery room. 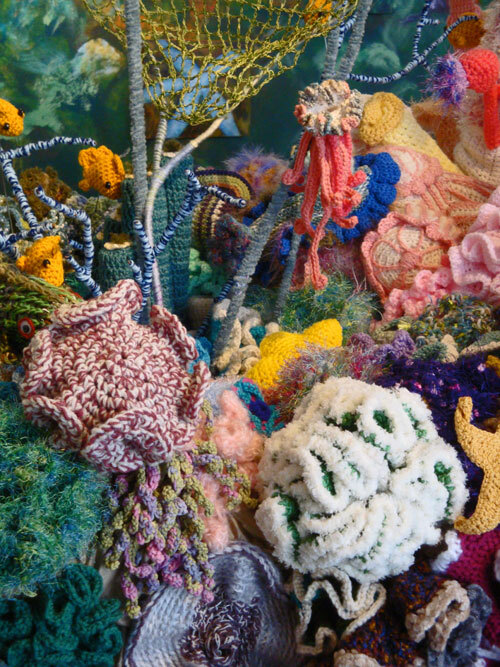 Not only is this coral reef of crochet remarkable, but it is highly imaginative in its concept and represents the work of some exceedingly talented people. 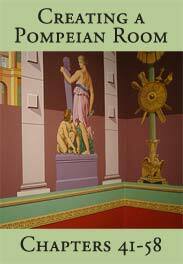 So many things about it are utterly glorious, not least the vibrant colours which are used throughout. And such thoughtful touches, such as the area bleached by oil spillage. This is something which we should love to have seen for ourselves, knew nothing about it and are so pleased that you have posted on it. Thank you so much. I think the great thing about this project is that it engages people to think about very serious subjects through fun and whimsy. I can report that this craftsman gallery, which has years of success, has never been more crowded, and with whole families. From the standpoint of raising awareness, the concept is brilliant. What an incredible collaborative project! I love when art teaches. 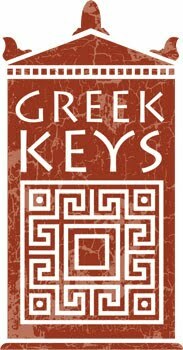 Done by 267 different artists but assembled by a few masters. I can't imagine it was easy to assemble so many colorful art pieces into one cohesive final project. What could be extremely chaotic is assembled quite skillfully. Hi, Steve - The assembly was put together over a fiberglass "reef" so that it had great dimension. That was enhanced by having a lot of the fish projected slightly above the reef on thin wires. You can see that in the last photograph, in front of the octopus. Oh my, Mark, this is incredible. I should say the 'concept is brilliant' - agree completely. Anything about the natural world that involves us in such a viscerally exciting way has got to be good. This is something that once actually seen is probably never forgotten - also a good thing. Think of the 'man' hours and devotion needed to put this together. Amazing. Yvette, this gallery project reminded me a quite a bit of mail art - individual contributions to a theme, and then the whole ends up being greater than the indiviual pieces. I've already gone back for another look . . .
Hey Mark - Totally far out!! But, I kinda like it. Pretty cool and educational. And, 100% original. Have a great weekend. 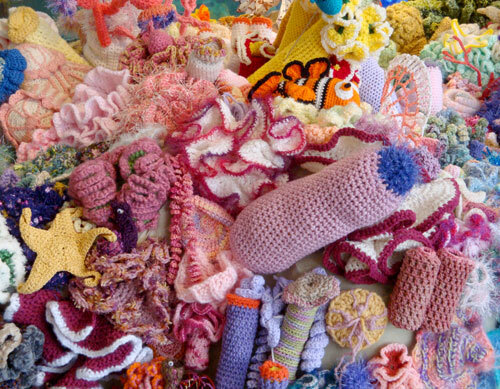 To be honest not a fan of crochet, but I do like the whimsy and the fact that so many people contributed. Our Great Barrier Reef is one of the reefs in danger. My parents visited Australia and fell immediately in love with it. I haven't been fortunate enough to visit . . . Someday, when there's a little more in the piggy bank! Whoah! What an eyeful of color and texture. This is terrific. I enjoyed each photograph. 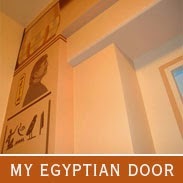 Thanks for posting these and your storyline is always thoughtful and well written. Very impressive. 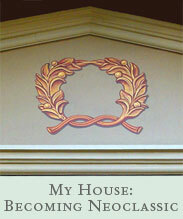 Hi, Mrs. D. - Thanks for the nice comment - I knew you'd enjoy this. Like your own projects, it shows so much creativity and dedication. How whimsical. I think the unexpected aspect of the exhibition is clever because first it engages people, and while they are observing, they are drawn into considering this extremely important ecological issue. Thank you so much for drawing attention to this great beauty, and this very serious problem. Hi, SWF - I have no doubt that this art project brought more attention to an important ecological problem than any number of lectures. 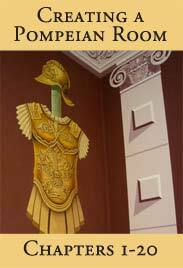 As I mentioned, there's another exhibit that's been touring the States for at least five years. So impressive and fun! Cheers for the Florida Craftsmen organization and cheers to you Mark for sharing. Hi, Anyes - Your comment is a reminder to me that I should cover more of Florida Craftsmen's exhibits — it's a very fine gallery that often takes interesting directions.